One of the major milestones in medicine was the development of artificial circulation, also known as heart-lung bypass. Before the heart-lung machine was invented, heart surgeons operated blindly, with the heart still pumping, or by slowly chilling the patient's body until circulation nearly stopped, or by connecting the patient's circulatory system to a second person's system during the operation. All of these methods were extremely risky. An American surgeon named John H. Gibbon Jr. (1903-1974), began pursuing the goal of total artificial circulation in 1931 after a young female patient died of blocked lung circulation. Gibbon realized that it was necessary to keep oxygenated blood circulating without use of the heart, especially to the brain, to carry out careful operations on the heart under direct vision. His pursuit was to last for almost three decades. After years of intensive experiment, John Gibbon, his wife, Mary, and others were able to construct a heart-lung machine to allow such artificial circulation. On May 6, 1953, surgery using the heart-lung machine was successfully performed on the first human, 18-year-old Cecilia Bavolek, to close a hole between her upper heart chambers. Gibbon's original heart-lung machine was massive, complicated, and difficult to manage. It damaged blood elements and caused bleeding problems and severe consumption of red blood cells. Because of its ability to permit corrective operations to be performed inside the human heart for the first time, however, these drawbacks of heart-lung bypass were considered acceptable. The era of open heart surgery had begun. Gradually, the safety and ease of use of heart-lung equipment improved. With today's state-of-the-art machines, minimal blood trauma occurs during heart-lung procedures. It is now commonplace for surgeons to stop the heart from beating for several hours while the circulation is maintained by heart-lung equipment. Now that patients can be kept alive during heart surgery, a whole new range of operations has become possible. Congenital heart defects (those occurring at birth) can be repaired. Diseased or damaged heart valves can be replaced. Coronary bypass surgery, in which a replacement blood vessel is used to carry blood flow around a blocked section of artery, is commonplace. Thanks to Gibbon's heart-lung machine, open-heart surgery, especially coronary bypass, has become routine throughout the world. A heart-lung machine. Before the heart-lung machine was invented, heart surgeons operated blindly with the heart still pumping. siphoned into a reservoir. It is then pumped through an artificial lung to expose it to oxygen. When the blood is passing through the lung (or oxygenator), it comes into close contact with the surfaces of the machine itself. Oxygen gas is delivered to the interface between the blood and the machine, allowing the blood cells to absorb oxygen molecules directly. The blood is now red in color, owing to its rich content of oxygen. The heart-lung machine next pumps the red blood back into the patient through a tube. The heart-lung circuit is a continuous loop: as the red blood goes into the body, blue blood is drained into the pump. 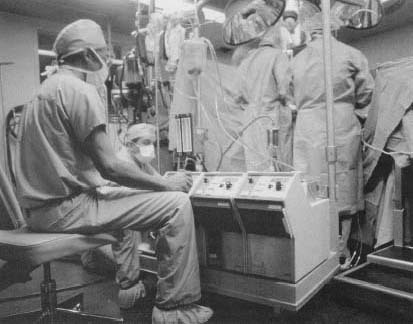 My Grandfather was one of the original inventors of the Heart and Lung Machine. He worked for a Dr. M.M. Ter-Pogossian at Washington University School of Medicine in St. Louis, Missouri. If at all possible, I would greatly like some extra information about how it was invented and why? My daughter is doing a biograpy on my grandfather (Julious Hecht). This web site is very good by the way. Do you have a photograph of Dr John H Gibbons and a photo of the first heart lung machine. I am doing a ppt presentation on the history of heart surgery. I love to see operations of heart ani like to know about heart organ. If u can send me videos of heart operation and images as well because this is good website that i had ever seen. This will help me on my study. Thank you. Hello,my name is Tom. I was doing some curious research on the topic of the heart/lung machine and it's history and I found your site. I hope someone gets back to me with an e-mail. You see I was born in May of 1953, the same month and year Dr. Gibbons did his 1st sucessfull surgery, and I was born with 3 holes in my heart. My surgery was not able to be done until I was age 6 which was in 1959. I was on the Heart/lung machine(Basically Dead)for 51 minutes. I think the whole surgery took about 6 hours. I was told in later years that I was the 2nd sucessful child patient in the US. I am not sure if that's true and looking for some help to find out if this is the case? I was born 5/21/1953 and now am 56 years old, be 57 in May 2010. My surgery was done in LA, CA. at some Ladder Day Saints Childrens Hospital. A book was also written about me called "the Operation" and I would like to find a copy of it. My time is limited now but I am lucky to even be here still and would like to know about all of what happenened to me when I was 9 and had the surgery. I would greatly appreciate any help or information you or you readers can provide.Thank you,Tom M.
My sister Debbie Ballew was a major contributor to the Gibbons Heart Lung Machine being purchased for St. Louis Children's Hospital in the 1950's. The PARADE magazine did a story [a campaign] about her ventricular septal defect and the need for the Gibbons Heart Lung machine in St. Louis to save her life and many others in this area. Her story brought in much more money than was needed, but sadly she died soon afterward. I would like a copy of the newspaper that did the story on her. I am so proud of her contribution. I found this site in looking for information on the origin of the heart-lung machine. I was curious, because the machine was used on me twice, both in Cleveland, Ohio. The operations were to repair the septum between the ventricles in my heart, a congenital defect, and I had the surgeries in March 1955 and March 1957, when I was 9 and 11. When they went in the second time, they found other holes they had not corrected in the first surgery. Tom, i find it very unlikely that you were only the second successful child patient in the U.S., since I knew of several other children who had undergone the operation by my doctor around the same time mine were done. I have a newspaper clipping from August 1957 which shows me standing in front of the machine (about the size of a fireplace), with the surgeon standing to my left and the anesthesiologist standing to my right. My brother, Jack Fuchs, was born in May 1951 and had successful surgery at St. Louis' Firmin-Desloge Hospital in March 1954. At the time, my parents were told that his was only the fifth successful surgery of this type and the first performed on a young child. The other patients had lived 2-3 weeks after surgery. Jack had the surgery repeated twice before he turned 21 because his normal growth made it necessary to retrofit the valves to the increased size of his heart. He repeated the surgery again when he was 37. Sadly, although he survived the surgery, he did not recover from it. I had my first open heart surgery in January 1957 in Cleveland. I was twelve at the time. Thirteen years later I had my second one by the same surgeon. I'm now retired after 21 years of teaching in public schools nd nine in as university adunct instructor. I have two children and five grandchildren. Now I'm in the process of doing research for my memoir. I had open heart surgery at Jefferson Hospital in June of 1953, at the age of 5. I was the 2nd person at Jefferson to reap the benefits of Dr. Gibbon's Heart-Lung machine. They corrected a patent ductus arteriosis. As far as I know I didn't make the papers anywhere, but many years later I did meet up with doctor who administered the anesthesia to me at the time and he was not only surprised, but delighted to find me well. Reading all the comments makes me appreciate ever so much the bravery of the parents of those who had heart surgery when it was in its infancy. My daughter was born in 1983 with Critical Congenital Heart defects. If not for these parents who were willing to try what they could to help their children, surgeries for my daughter's defects would not have been available. My congenital defect, patent ductus arteriosis, was corrected at Montefiore Hospital in Bronx on June 19, 1953 using the heart/lung machine. Another surgery was performed the following March to correct scar tissue. A murmur is all that has remained over the years. At the time, I was one of six children and wonder how my parents were able to handle it all. I had open heart surgery in August of 1951 at Walter Reed Army hospital. I was 7 years old and that I was the 3rd person that was put on the heart/lung machine. I am now 74 years old and still living a normal life.